Today’s high end desktop platform is called Dragon. It’s what you get when you combine a Phenom II, AMD 790FX/GX chipset and a Radeon HD 4000 series graphics card. Nice, but that’s old news now. Next year the high end platform will be called Leo. It’s made up of a Thuban CPU, which is an updated Phenom II rev sporting as many as six cores. It’s still 45nm so don’t expect much in the way of new architectural features. Graphics comes courtesy of the Radeon HD 5000 series, which we all know and love. The chipset is going to be AMD’s new 8-series, complete with a new SB850 south bridge. In 2011 we get Bulldozer and it comes in the form of the Zambezi CPU (AMD’s codenames are such fun). You’ll see four and eight core versions of Zambezi. Both will support DDR3 and both will work in Socket-AM3. Obviously guaranteeing motherboard support this early in the game is difficult, but AMD is usually good about maintaining socket compatibility. You may be able to slip a Zambezi into your current day Socket-AM3 motherboards. 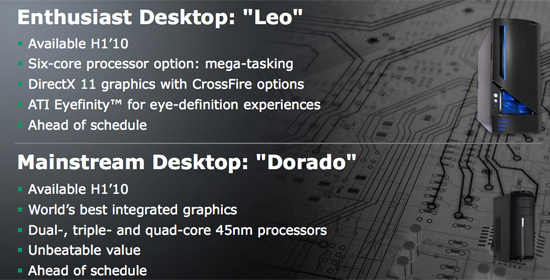 All this plus a chipset and AMD’s 6000-series graphics makes up what’s going to be called the Scorpius platform. Moving down one notch to mainstream, today we have the Pisces/Kodiak platforms (yep, never heard them called that either). That’s made up of Athlon II CPUs and the 785G chipset with integrated graphics. Next year we’ll have Dorado, which consists of Athlon II CPUs and next-year’s integrated graphics chipset. Unfortunately it won’t be a DX11 chipset, AMD is only listing 10.1 support in the 2010 platform. Which means that the graphics we’ll see in 2011 integrated on-die will be a derivative of the DX11 Radeon HD 5000 series we have today. Sweet. The 2011 mainstream desktop platform is called Lynx, purr. It comes with the Llano APU, which as I mentioned before, doesn’t use Bulldozer. Instead Llano is made up of as many as four 32nm Phenom II-like cores. Llano also features an integrated DX11 GPU. Llano will require a new socket as the pinout will have to support video out just like Intel’s Clarkdale. Finally. Im tired of Intel dominance. I havent seen seomthing really exciting from AMD like this in a long time. All the AMD stuff for the last three years have looked skimpy at best. But they really have a lot of stuff coming out. Not only that but it really looks like its going to be competitive this time. Late or not its better than nothing. Better than what theyve been coming out with for the past few years anyways (like that original Phenom bs). Happy to see that they are catching up pretty fast. I also want to note that a combined CPU/GPU code that heawyly depend on each other (for example a complex game engine where AI,physics and colision detection would depend on each other and interact) would run several times faster with merged GPU/CPU (with shared higher level caches and same ram pool) than with a stand alone GPU and a CPU(it would crawl on a stand alone gpu and cpu actualy). With GPU comunicating trough pcie buss and with its own memmory the latencies would kill this kind of tasks. Its actualy one of the reasons why nvidias physX just act as a added layer with minimum game code interaction. The amd-s fusion is actualy a giant leap in this direction (to a real monolithic cpu/gpu). Nvidia doesnt have cpu-s and intel doesnt have a gpu (i doesnt count the GMA series). 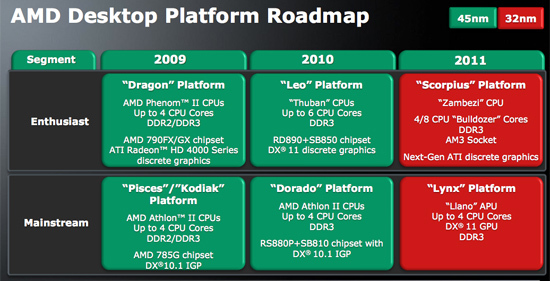 Unfortunately for AMD, 2010 isn’t really interesting. The company will have to rely on aggressive pricing and the continued success of its graphics teams to carry it for the next 12 - 18 months. Funny, I worked at a semicon company here in Calif. There was this crazy engineer who wouldn't shut up about Zambezi. Every spare moment he would be working on it, swearing that AMD was going to want the specs right away. Everyone would scream "Stop working on Zambezi!" Do something useful. Yes, he also forgot to mention that the GPU Core of Llano 1st gen Fusion APU will be leveraged by DirectX11 DirectCompute and OpenCL in constrast to Intels crap IGP GMA successor in Sandy Bridge. A perfect candidate for Laptops and low priced mainstream desktops. Beefy desktops will reside with Bulldozer 8 cores / 16 threads and ATI's next gen 32nm discreet GPU at probably 8 Teraflops on the X2 Parts considering that Hemlock X2 has 5 Teraflops of Floating Point Power. Wait, wait, wait, wait,... 1 billion? That is only a bit more than a 4550 (~250M). So what I am hearing is, the next-gen, not-yet-released, coming-in-2-years, the-bees-knees, 32nm APU chip has a GPU is about as fast as the lowest end 55nm card you can find? Wow, I am so impressed... NOT! I guess this one is just IGP replacement for fusion platform. And if my guess is right, should take about 150 mm^2. Making the price around 80-150, depending on competing intel stuff. But I do agree with your 150mm^2 assumption.